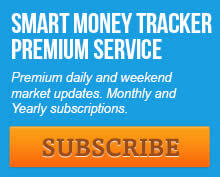 The transports have completed a monthly swing and are now leading the markets out of the 7 YCL. An even more precise way to time tops is to monitor the NDX contracts. When the NDX net short position rises above -7 billion it’s time to start looking for a top. The current NDX level is less than 1 billion net short. Great metaphors in this post, Gary! Be the Phoenix, not the flame singed moth. Do you mind if I ask where you source your COT data, Gary? Does this chart, which shows the Commercials suddenly net short the S&P, not reflect their positioning accurately? No it is not accurate because it doesn’t include the emini data. Most of the volume nowadays is in the eminis. You have to combine the large and small contracts to get the full picture of what is going on. Thanks so much for your reply, Gary. Much appreciated. I clearly have a lot to learn. Great information, Gary. Where do you find the COT data for the stock futures in the format you show? 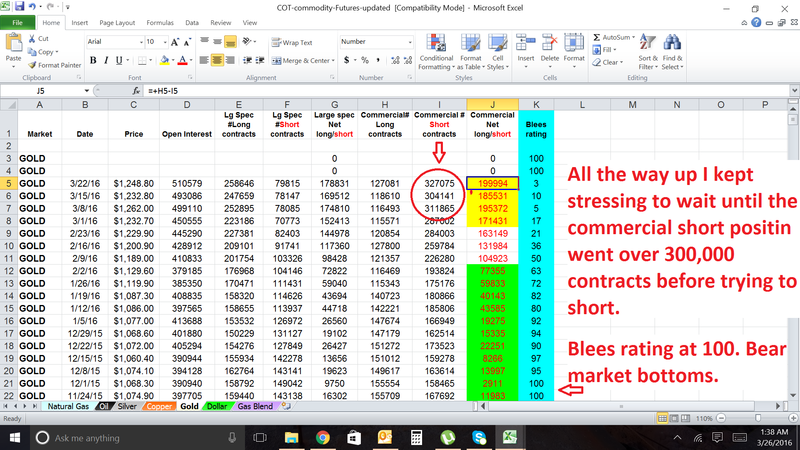 I copy and paste it to my spreadsheet that has the formula to automatically calculate the Blees rating for all contracts. Gary do you normally post the cot and blees ratings weekly in your premium site? Also does the COT report not work for oil? I remember you said the bottom was in on oil and told everyone to buy on Korelin site just before it ripped to new lows. thanks keep up the good work. I do update the COT’s every week and yes I was one intermediate cycle too early on oil as well as gold. The last ICL occurred in the middle of the normal timing band for the CRB’s 3 YCL so I took a stab at that being the bottom. The latest ICL is occurring at the very tail end of the normal 3 YC timing band so the odds are much better that the bottom in February was the final 3 YCL in the CRB and the final 7 YCL in stocks as they should both occur together. This came right at the time when economic data was very weak which is as it should be during a 7 YCL. The problem most people like the perma bears over at Kereport have is that they give in to recency bias and are unable to project an economic upswing. All they know is what has come before so they assume it will continue. Unfortunately both Rick and Chris are the worst offenders. The thing is that if the 7 YCL is complete then the economic data isn’t going to get worse, it’s going to get better. And the glut in oil is going to be quickly used up as the global economy starts to heat up again. That’s what all of the bears are missing. They are stuck in the past unable to see the change that is already in progress. Gold also has completed a monthly swing and for the first time since the bear began the character of the rally has changed from a bear market rally to a new cyclical bull. Oil too has completed a monthly swing along with massive momentum divergences. The 7 YCL, while I think it was cut a little bit short by a large intervention in Feb. clearly delivered the minimum decline necessary to qualify for a multi-year correction. It reached oversold levels on the monthly chart, completed a quarterly swing high, and is now clearly emerging from the final bottom to start a new 7 year cycle. Even if this 7 year cycle is destined to be left translated (and I expect it is) there is virtually no chance of it topping in less than 3 years. Gary , aren’t Cot updated at the end of the week normally? Also yours was dated for the 22 which was the day before the $30 dollar fall in gold. 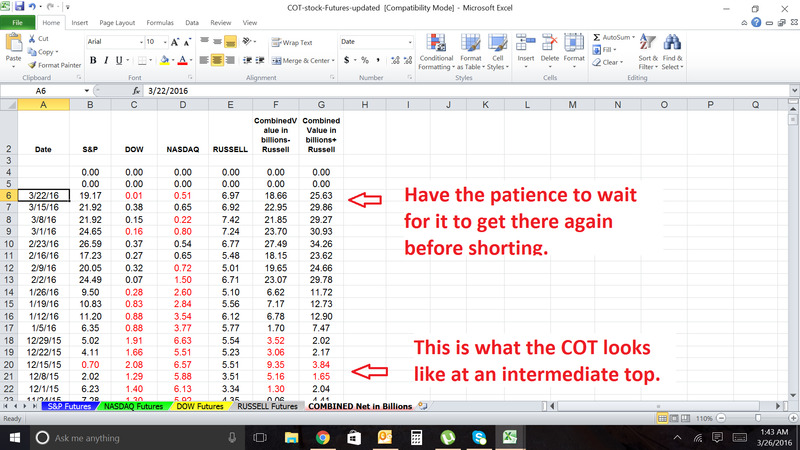 Basically the CoT probably has changed and commercial shorts could have decreased . Why don’t you do your COT analysis of report at the end of the week when Cot reports are updated? Just wondering if it would be more reflective of current gold price and sentiment. thanks sorry for being such a pain . The data is complied on Tuesday after the market closes but isn’t available until Friday at 3:30. So yes the data is delayed but since it is more of a multi week to multi month type of signal a few days isn’t really significant. Yes I went and saw that on Cftc site. Thanks keep up the great work… And Al took my jab at Avi off. So you think biotechs will rally fir a few weeks ? Thanks again For your explanation on oil. I am going to sign up on premium site . I think bio tech will rally for a few years. I can’t predict what its going to do tomorrow though. Kudos on the COT and sentiment. The new boys in town. Perhaps the better new tools to pay attention to versus classic TA. When too many programs trade off the the same thing as is the case with many of the tools used in TA …. it gets discounted. There is NO BABY BULL YET !!!! You longs will be slaughtered now. Keep your longs please. Highest open interest in 4 yrs. Highest commercial short position in 2 years. Annihilation soon. Clive Maund, one of the most well spoken contrarian indicators out there. Clive Maund was NOT bearish for the long term in PM,he thought we are in a new bull market,has he changed idea lately? No He is correct in saying that the bugs are way to bullish and need a taming. Big correction coming, this might not be the set up all the bugs were hoping for. So this have nothing to do with the mantra “there is no baby bull yet” . Maund thinks we are experienced a correction in an ongoing new (baby) bull market. So why all these hysterical rant ? Marco. This correction will determine if we are in bull market or still in bear market. We never made higher high (1308 on gold) on gold and silver chart is a joke. Look at them both. Silver is telling you PM sector is still in bear market. You have to look at hole PM sector not just Gold and say woo hoo let’s go. Gary as always is always jumping a gun. Clive is not taking any stance besides longs now will get annihilated. Based on this correction we will know more soon. It would be out of cartel character to not annihilate all long to oblivion so don’t expect technical levels to hold but that’s my opinion. Gary’s problem is and always has been bullish biased as he never takes short positions in miners or gold and is always bullish. LOL way too late, We already booked profits and are waiting on the sidelines. Good. Annihilation of 258k large specs and 30k small specs is coming. We will be making new lower low. Back into trend channel for gold. (see below chart) Silver will get wiped off the map. (see below chart). It has highest short position in last 2 years too. The fact silver never made higher high says PM sector is NOT IN BULL TREND and this was viscous bear market rally but downside move will be equal or bigger then current move. Gold never made higher high either as it need to break 1308 for that to happen. Your so convinced you had to repeat yourself. stewie, any idea what Clive Maund’s latest article is about? It is titled ‘COMMODITY & STOCKMARKET COT ASSESSMENT – dramatic developments…’. Is it possible that he has looked at the COTS and come around to Gary’s line of thinking re the conventional markets? Janin i have no sub to his site so not sure. I think the line is more in line with commodity COT. Read the 30,000 coffins article he has released. Bill i clicked submit twice when it was thinking so it double submit it. Ah, you are just talking about gold. What about the conventionals? Gary has used the COTS to show just how bullish the commercials are on conventional stocks – Perhaps Maund has just realised the same and that is what his latest article might be about? It will be interesting to find out. Gary has already stood aside from gold for now. Silver similarity pattern. COT supports this move along with similar pattern structure. Back into bear trend channel. they are saying your gold baby bull is already dead! And this just after a slight retracement in PM….just imagine what will happen when gold will broke 1200!!!! LOL all markets need corrective moves .Nothing unusual happening other than the midnight attacks have stopped. Simple, to the point, and understandable. 3 weeks later, I see that i’ll-know-more-in-2-weeks over at the exclusive site for retards, is finally seeing the same target. Which, um, site are you referring to Irwin? You could be referring to any one of countless finanical sites on the web. Your insult needs to be specific otherwise we don’t know what you are talking about. Some advise from a humble guy. I visit this site as I see value. It’s certainly not a day trading site, if your not experienced….. you will get whip sawed and loose your $$$ tick by tick…… YOU need a good Trading syatem….. Hence Gary site is for longer term trades !!! Thanks for your thoughts, Joseph. It sounds like good advice. Gary not to many people say it enough but I want to personally thank you for your continued exhausting efforts to keep this blog alive for one and educational for many and interesting it’s a complete package. Not to many understand how taxing it is to do a news letter daily, so thank you and a very happy Easter to you and yours. I am new to COT report. There is ” dealer’s position” ” asset mgr position” and ” lev money position”, how do you get the #long contract for smart money? Thanks a lot. Thanks Gary for your hard work! There are so many doubters of the gold baby bull that I won’t be surprised if it kicks into high gear again as we get through the end of March and first week of April. Bears should shorts this week or it could get real ugly for them over the next few months. Say the word G-money, I’m ready to buy XBI or add to my miners any day now.